Belper Town Council is featured as part of a national World War I commemoration during this anniversary year. Belper Memorial Gardens which has been designated as a Fields in Trust Centenary Field and protected as public green space in perpetuity, will be featured in the Centenary Fields Legacy Programme, to remember those who served and lost their lives during conflict and to say “Thank You” to the World War I Generation. Fields in Trust will reveal the story of one Centenary Field each day in an online interactive map. On Monday 10 September Belper Memorial Gardens will be the featured Centenary Field. 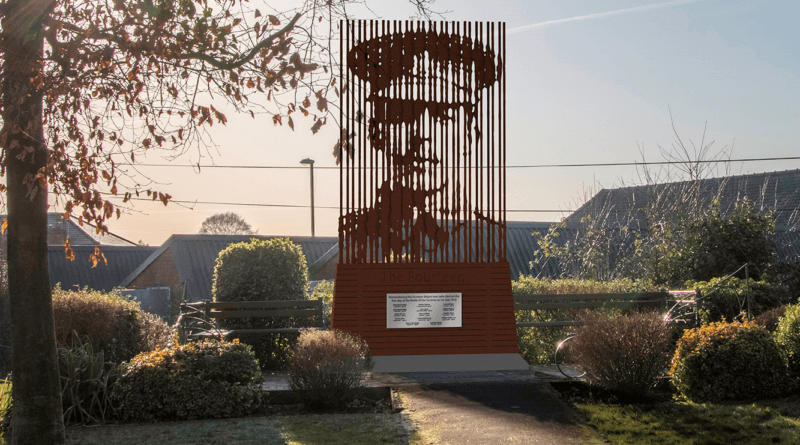 On 10 September at the Memorial Gardens the Belper in Wartime Group will unveiling a half-size prototype of ‘Sacrifice’, an installation planned to be built in the Memorial Gardens to commemorate the town’s fallen from the First World War. The installation is a representation of Jim Green, one of the Belper men who died, and is being financed through fund-raising by the group and its members. The ‘Sacrifice’ sculpture was designed by local artist Andy Mayers, and will be made from Cor-ten steel which will rust initially creating a lasting seal from the elements. There will be an opportunity to view the installation prototype and donate towards the final version in the Memorial Gardens from 11am to 1pm on Monday 10 September. The Centenary Fields legacy programme will run until the anniversary of Armistice Day on 11th November. This campaign is in delivered in partnership with the Royal British Legion’s “Thank You” project highlighting the nation’s gratitude to the generation who served in WWI. This UK-wide programme will showcase a series of community events and activities. The Fields in Trust Centenary Fields programme is working in partnership with The Royal British Legion to protect parks and green spaces in perpetuity as an innovative way to honour the memory of the World War I servicemen and also those, military and civilian, who played their part on the home-front to build a better life for the benefit of generations to come. Centenary Fields protected as part of the programme include war memorials, parks and recreation grounds, memorial gardens, playing fields or other green spaces with a significant World War I link. Stories featured will highlight the contribution of individual combatants, those who returned – and many who did not. We will also look at memorials to the fallen, ranging from simple village stone cross to more intricate commemorative sculpture. We will explore how these parks and green spaces served the War effort – for example providing timber for trenches. We will also address the contemporary resonance – communities doing something now to remember the sacrifice of 100 years ago. The Centenary Fields Legacy memorial project contributes to the Royal British Legion’s Thank You movement. These important spaces form a vital part of local heritage and play a key role in making the First World War relevant to today’s generation – fully embracing the spirit of this centenary year. Communities are encouraged to organise Thank You events in Centenary Fields throughout the year. Special thanks go to Briton Fabricators of Hucknall who have constructed the half size prototype of Andy Mayer’s stunning sculpture ‘Sacrifice’. Donations for the construction and installation of “Sacrifice” can be made via the Belper In Wartime web site.